a spanner in the spokes…. Since our last blog we have had a rather big twist in our trip. Back in Panama, most days I had been feeling not my normal self but put it down to long days riding in the heat, however this continued into Colombia. I eventually found out I was a couple of months pregnant! We rode to Bogota to try to get the necessary check ups. After much deliberation we decided we still wanted to cycle but Latin America was posing too many problems. So a cheapish flight to Madrid was our decision and to cycle home from there. We left Colombia a little sad but very excited about the future and hopefully one day will be back to finish the journey south. Craving fresh fruit and veggies, we found an amazing vegetarian restaurant for our last few days in Bogota. New Jeans and a new city, we are back in Europe! The Palace in Madrid. Note the lovely blue sky which soon disappeared as we got back on the bikes. Beautiful magnolia in the park. As we headed out of Madrid and towards the mountains, the Colombian off road theme continued and we soon found ourselves back on gravel roads. Lovely towns and tiny villages all with beautiful churches and houses. It was funny to the see similar buildings and plazas that we were so used to seeing in all the colonial towns we had travelled through. Cycling through the poppy fields, trying to out run the storm clouds! The national park, Canon Del Rio Lobos. We decided to take the mountain bike trail through the national park. Concentration! Still finding rivers to cross but no worries of crocs in these ones! Up through the beautiful Canyon. A very wet day but a very lovely ride, through the mountains. We thought the riding would be a little bit easier in spain, however with stong headwinds and some high mountain passes we were in for a shock, but the views have been great, lots of wild flowers and food we have been dreaming for months of eating!! Our downhill descent into the Basque region. Mutriku, back on the coast and heading towards France. The cause of the detour! In Bogota we were lucky to stay with great warmshower host, Angelica and Claudio who helped us so much with the doctors. I was able to go for a scan and have all the necessary blood tests. Back on the road and heading towards Bogota with the traffic not so bad we decided to take the regular route via Villa De Leyva. With lots of mountains and scenery and high altitude farm lands the ride into the capital was enjoyable even with a few wet days thrown in. The steep streets of San Gil. We had a couple of days here wandering around town working our leg muscles on these hills. Lots of road side treats for very sweet teeth but good cycling energy. After some long hills we came across a random Swiss Cafe selling delicious Brocolli and cheese crepes, very much needed. On the road to Villa De Leyva we cycled through a lovely canyon and with so much rain there were waterfalls pouring on either side of the road. However at 2500 meters high it was a little cold for swimming! Cycling in the clouds and with the green fields we felt like we were on a day trip in the Brecon Beacons! Although it was wet it was really enjoyable cycling with very little traffic. Looking for the pot of gold at the end of the rainbow. Entering Villa De Leyva, a really lovely town in the mountains, we found it hard to leave here. We spent four days just wandering the little cobbled streets and eating great food. We camped in the garden of the hostel Renacer which had a good backpacker feeling. Couldn’t resist buying some of the local spun wool. The cobbled square of Villa De Leyva. A little bit of bike maintenance and cleaning, luckily the sun was out! Chiquinquira, a small town full of churches and plazas. A new favourite second breakfast, we discovered that all the little bakerys do fried eggs with bread and a cup of Colombian coffee…ummm! Not our favorite food option, but good for all those meat lovers. Zipaquira, the main attraction here is the salt cathedral, an old salt mine transformed. Its a fasinating place to visit. Walls of salt, we didn’t lick them though! Back out into the daylight, the main plaza Zipaquira. La Candaleria, the historic old part of the city, full of cafes, restaurants and Museums. Botero’s Mona Lisa, he manages to make everything look fat. A great collection of his work in one of the many museums and galleries in the city. Colonial houses complete with colonial locks. At first we were not sure about the city, it felt very big and dirty. However once we scratched the surface, walked the cobbled streets and found good veggie food, we discovered a great city that really grew on us. taking the back roads south…. We left the wetlands and headed for the foothills of the Andes, Siska, Michiel and Joost turned off onto a different route, so we said our goodbyes but hopefully will meet them again in a few weeks. There was no option to avoid the hills whichever way you went you would soon be going up! However it felt nice to be climbing higher and the temperature drop making camping much more pleasant. The first hills, everything was so green it was as if everything was covered in a layer of moss. There as been a lot of rainfall in this area aswell. Although the views were good, the ride was made hard by the constant stream of trucks. Due to landslides a lot of the other roads in the area had been closed so all the traffic was channeled into one road. A policeman told us where there would normally be a hundred trucks there was now three hundred. After the town of Bucaramanga, the thought of the traffic and with encouragement from Cass we decided to take the back roads to San Gil. Our first stop was the little town of Giron, a picture perfect town with all whitewashed buildings, and a great bakery for morning snacks. The beginning was a mixture of paved and gravel roads but the lack of traffic was lovely. Tobacco leaves drying by the side of the road. We cycled passed orange, pineapple and tobacco farms on our way through the valley. Soon the fate of our day came into view as the road switchbacks up the other side of the valley. A well parked car provided a shady rest spot on a 40c day. Rest stop over, on up the hill! As we climbed higher the views were really spectacular. We often see road side graves but this is the most impressive one so far. The town of Zapatoca, we had planned to stay here, however with our long breaks to stay out of the sun we had to camp 10km before the town but it was a good stop in the morning for breakfast. We were a great fascination for the town and one man even weighed our bikes in his shop to see how much we carried, he then weighed all of us!! It was interesting to find out how much we carry and were all around the 46kg. We had a long gravel descent and soon came across the idyllic village of La Fuente. we stopped for drinks but soon pushed on as we knew we had more hill climbing in the heat to do. Another big hill and the next day we arrived in the even more picture perfect town of Barichara. Beautiful painted houses and cobbled streets. In the bakery we met Carlos, a local artist and mountain biker, he had heard we were coming from the guys in the bike shop in Bucaramanga and invited us to stay. His house was a beautiful a 12 year project of his. He was not staying as he had another house in a neighbouring town, but gave us the keys and said to make ourselves at home, amazing hospitality. We have loads of photos of little doors and windows, each one seemed to have its own charm. I liked this plan and simple one! It was a longer tougher rider this way, but really worth it for the great views, good camping spots and amazing towns and villages. We left Cartagena, which was a bit of a bottleneck for cyclists. While we were there we met 6 other cyclists which was really great, swapping stories and comparing routes, we headed out of Cartagena with two Dutch cyclists, Joost and Michiel and a Belgium cyclist Siska. The other cyclists had already left but we planned to met them again in a few days. It was lovely to be back on the bikes after a good rest. Leaving Cartagena was busy with traffic, but we were heading to an old colonial town called Mompos and soon were able to turn off the highway into the countryside. Hiding from the sun under a truck, on the ferry across to Mompos. We had heard there had been a lot of flooding in this area, which we could see as soon as we got off the ferry, but it was lovely to ride alongside. Brick ovens along the way. Our first sights of the flood damage on the way to Mompos. Santa Barbara church, Mompos. We had really enjoyed wandering around Cartagena but Mompos was even better, with its very hot, sleepy streets and beautiful buildings. It was so peaceful wandering around, some of the 18th century buildings are still used for the same purpose, even the rundown ones still looked lovely. Beautiful old doors and locks. La Casa Amarilla, our guest house, which was so lovely we could have stayed for weeks. We were again 8 cyclists here, as we met up with Cass from England and Arnold and Ann Claire from Belgium. The graveyard at Mompos, with walls of graves. Lightning from the roof of the guest house. 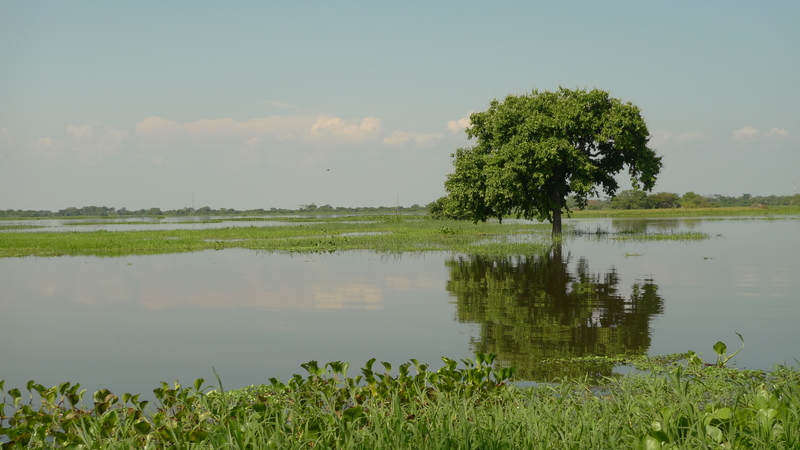 Getting to Mompos had been straight forward and the floods had not effected us much, leaving was a different story. It was raining when we left so we were soon riding in the mud. At least someone was enjoying it. The sun was back out but the ride soon turned into an adventure, with roads flooded or washed away..
Luckily everything is possible here and we all piled on to a little boat, this was the first boat of many. It was amazing 6 cyclists in one little canoe. Some of the boats were really small and very wobbly. Cass and Joost smiling while trying not to fall in. It was a long day with all the river crossings, but a lovely evening as we arrived into the town of El Banco. Something other than floods, little chicks for sale. El Banco, in the morning we really saw how flooded the town was. It was crazy how much water there was here, the only way out of town, other than the way we had come in was by boat, which took us 20km or so to where the road was clear again. It was a great adventure and well worth it to see Mompos and the area around, it was also amazing to see people just get on with life even with such bad floods, they have had flooding here since November, but everyone stills carries on. We are now heading up into the mountains so hopefully not so many river crossing. We arrived safely in Cartagena, Colombia which is lovely and we have had a good time exploring the town, and getting a few jobs done, like finding funny sized bolts which had gone missing after the flight,and even managing to get a needed yellow fever injection! Our Spanish has hardly improved but with lots of sign language we always seem to get by! So here are a few pictures from our time off the bikes in Panama city and Cartagena. The Panama canal, its pretty impressive watching the huge boats coming in and the trains that help keep them in position, a bit more complicated than the Kennet and Avon! The lock house,with one of the little trains! Looking out over the new town. The infamous Coca Cola cafe which is said to have had the name before Coca Cola! Weather this is true or not, it’s a great place to watch the locals and good coffee. Putting the bikes back together at the airport, it was a bit of a pain boxing the bikes up but we were able to ride away from the airport with just one bolt missing! And colourful fruit sellers in the park. Watching the football in the local shop. Our new favorite snack, Arepa, a corn cake stuffed with cheese and butter on top. Cartagena is full of scultures this is one by Fernando Botero, also a famous painter. More art work around the old town. Everything is colourful here,even a bookstall. Every house is a different colour and as you move away from the tourist areas the paint is peeling away a bit more but somehow there is more charm here. Cartagena, we have had a great time here,and although it looks like we have some very wet cycling days coming up, we are looking forward to being back on the bikes tomorrow.